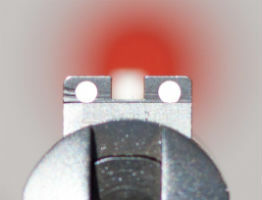 The two most important components of sight use are to focus the eyes on the front sight and then verify the alignment between front and rear sights. 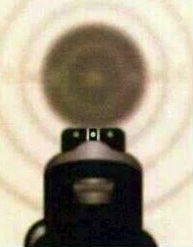 The eyes can only focus in at one point, and the front sight, rear sight, and target will all be at different distances from the eyes. We focus on the front because it tells us where the gun is aiming. If you are over 40, you probably noticed a change in your ability to see your front sight clearly. As we age, the ability of the eyes to focus up close is diminished and we need help seeing at close and intermediate distances. The technical term is Presbyopia. As shooters and Board Certified Opticians, we have carefully analyzed the challenge of over 40 shooters to arrive at the best solutions for aging eyes. If your distance vision is 20 20, but you need reading glasses, a reduced power is required to bring the front sight into focus, which also helps to blur the target. Click below for Non-Prescription Solutions. If you require prescription glasses and wear Bifocals, Trifocal or Progressive lenses, click below for Prescription Solutions. Bring your front sights into focus with our non-prescription solutions. 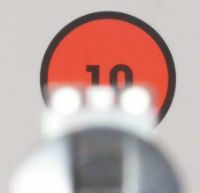 For the over 40 pistol shooter, the inability to focus at the intermediate distance that creates the biggest problem.